If your PowerPoint presentation contains a chart, you can edit the chart data directly in PowerPoint, whether the chart is embedded in or linked to your presentation. You can also update or refresh the data in a linked chart without having to go to the program in which you created the chart. Note: The Design tab under Chart Tools is not the same as the default Design tab in PowerPoint. The Chart Tools tab appears only when a chart is selected, and the Design, Layout and Format tabs under it provide different commands that relate only to the selected chart. Under Chart Tools, on the Design tab, in the Data group, click Edit Data. To edit data in PowerPoint, click Edit Data. This will open a window from your spreadsheet. Note: If the workbook you're working with has special startup requirements, such as enabling content, you'll need to also do that within the window. To edit data directly in Excel, click Edit Data in Excel. Make the changes you want. They will be reflected in the chart in PowerPoint. Note: The Design tab under Chart Tools is not the same as the default Design tab in PowerPoint. The Chart Tools tab appears only when a chart is selected, and the Design, Layout, and Format tabs under it provide different commands that relate only to the selected chart. Under Chart Tools, on the Design tab, in the Data group, click Edit Data. Microsoft Excel opens in a new window and displays the worksheet for the selected chart. In the Excel worksheet, click the cell that contains the title or the data that you want to change, and then enter the new information. Close the Excel file. PowerPoint refreshes and saves the chart automatically. Make changes to the chart data in the spreadsheet program in which it was created. In PowerPoint, under Chart Tools, on the Design tab, in the Data group, click Refresh Data. What if the "Edit Data" buttons are unavailable? 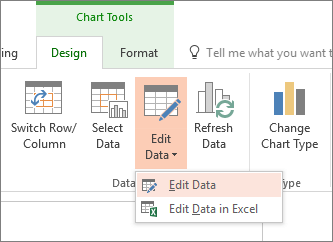 PowerPoint chart will not open Excel table when trying to "edit data"
To learn how to insert an Excel chart into a presentation, see Use charts and graphs in your presentation.